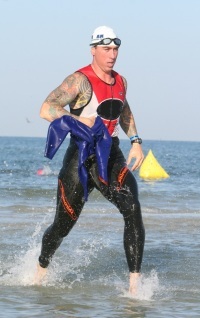 As a Total Immersion Instructor and certified USAT Level II coach and Race director, Joe Petrush has worked with hundreds of multi-sport and endurance athletes ranging from beginner to elite. In 2010, Joe furthered his experience and knowledge when USAT selected him to participate in their elite mentorship program at the Olympic training center in Colorado Springs . Besides participating in clinics and seminars to stay current with latest scientific findings, Joe also shares his knowledge at USAT coaching certification clinics teaching new and prospective USAT coaches. Joe is the head technique coach and founder of Bay Shore Swim, where he has spent thousands of hours specializing with swimmers in a one-on-one environment using a multi-lane endless pool and underwater video analysis. Joe’s expertise is hardly limited to the pool. He is versed in the design and application of power based training and racing plans for cyclists and triathletes, and also trained in the use of High Frame Rate video analysis for runners. From his experiences, Joe has designed one of the most comprehensive training programs in endurance sports, maximizing any athletes potential while reducing their risk of injury. Joe is also an active member of the local multi-sport community and enjoys competing in the sport of triathlon. He mainly focuses on the 70.3 distance and has competed in the world championship three times. If reaching your potential is important, you must train with a plan. More importantly, you must follow a plan that is your plan. All athletes have unique strengths and weakness, abilities, and motivators. At Premiere Coaching in affiliation with Bayshore Swim, we design training and racing strategies for dedicated triathletes. This comes in many forms and is tailored to you as an individual. This means assessing where you are today through scientific testing protocols, and identifying where you want to be in the future through goal setting. Lastly, we connect those two points with a customized training plan that changes dynamically to your fitness. What do our Athletes have access to? Often our athletes even travel and race together to make this sport more fun and affordable!